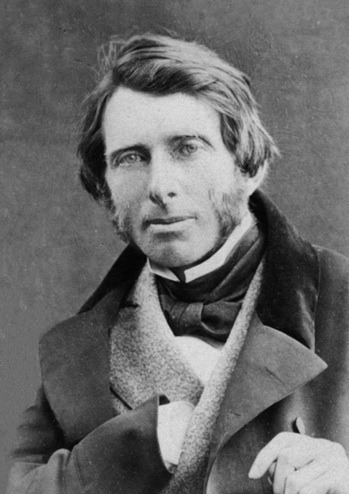 The most influential of all Victorian art critics, John Ruskin (1819-1900) first came to Venice as a 16 year old, and was utterly captivated, calling himself 'a foster child of Venice'. He would go on to write some half a million words about the then ravaged and neglected city he loved and was determined to save it from crumbling away, or as he put, from melting 'like a lump of sugar in hot tea'. His Stones of Venice was published in three volumes between 1851 and 1853 as a follow up to The Seven Lamps of Architecture, where he wrote that it was unnecessary to seek new styles of architecture, when there was already a true one: Gothic, especially the Gothic of Venice and the great medieval Cathedrals. During his research, he and his wife Effie lodged in the Danieli, which had just begun to welcome guests. She enjoyed the expat social whirl, while he made daguerrotypes and obsessively documented and measured every monument, looking behind them (Ruskin hated as 'dishonest' any veneer or hidden supports behind a facade), not only for his writing but for posterity, as he was convinced that much of Venice would disappear under the uncaring Austrians. The most influential section in the Stones of Venice was his discussion on the 'Nature of Gothic' that appeared in the second volume. Gothic was honest, inspired by nature, and made by craftsmen and artists who were thinking, free and creative—ideas that inspired William Morris and the founding of the Arts and Crafts movement. Ruskin was essential to the cultured Victorian traveller, even if Henry James compared the experience to travelling with a grumpy governess. In person, he was fairly intolerable. Although Marcel Proust fell in love with Venice through Ruskin, he carefully waited until the man was safely dead before he actually went for a visit.